These ultra-mini miniature painting tools are precision jewels! Ideal for painting miniatures, dollhouses, models, jewelry, nails, and wildfowl art, Silver Brush Ultra-Mini brushes are also great for airbrush detailing and decorative painting of all kinds. 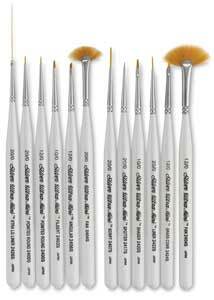 The compact, ultra-fine heads on these short-handled brushes make them perfect for working in tight spaces, while their iridescent, pearl-white Comfort Grip handles eliminate finger cramping during long painting sessions. Silver Brush Ultra-Mini brushes feature long-lasting synthetic Golden Taklon filaments encased in seamless, nickel-plated brass ferrules, for superb control with acrylics, watercolors, inks, gouache, enamel paints, or oils. 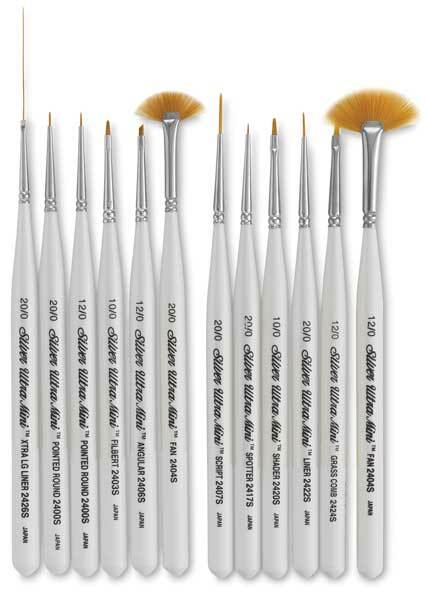 ® Silver Brush is a registered trademark.® Comfort Grip is a trademark. ® Ultra-Mini is a trademark.